HiH is providing mechanical engineering on two new construction projects that are keen to maintain a very comfortable indoor experience for occupants as well as to showcase clean and beautiful architectural and structural elements. As such, we conducted in depth reviews of in-slab radiant heating and cooling systems as the primary comfort conditioning element of the two designs. Use of a radiant system eliminates the need for large duct systems, ventilation equipment and grilles. In each case, the mechanical energy will likely come from proposed water to water heat pumps connected to a geo-exchange system with vertical boreholes. 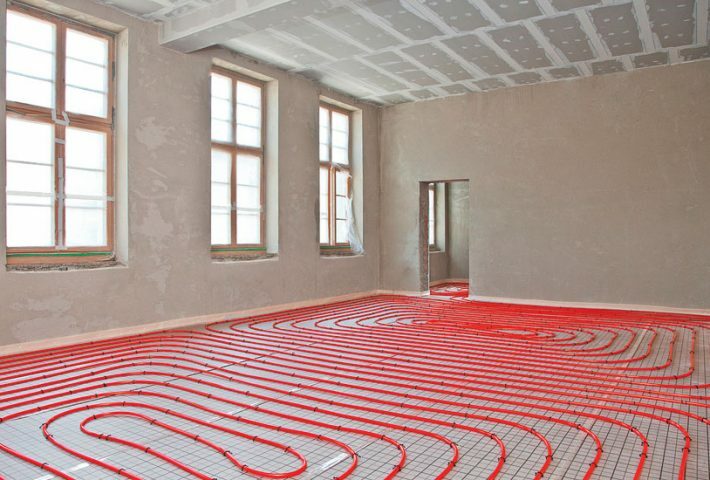 In-slab radiant heating is well understood, but there are not as many examples of buildings that also take advantage of the piping infrastructure to provide cooling. As such, we thought this was a good opportunity to highlight some of the key elements of a radiant cooling strategy. Cooling from radiant slabs is limited because if the slab gets too cold it gets uncomfortable. Typical slab temperatures for cooling are close to 68F and no lower than 66F. Output from a radiant cooling slab ranges from 10 btu/hr – 16 btu/hr. Output increases dramatically when in contact with solar gain (25 btu/hr – 32 btu/hr). Interior space temperatures higher than typical (76F – 78F) and achieve good comfort. Radiant piping should be spaced closely at 6” on centre to maximize cooling output. Be careful to control humidity to avoid the dew point which can cause condensation on the slab. Limit solar gains with exterior shading or with photochromic glass. Reduce lighting loads and plug loads (W/ft2) by at least 50% against typical code allowances.